Sometime in the early 1960’s, TV’s Jim McKay’s narrative on ABC’s Wide World of Sports highlighted the pageantry and excitement of many unusual and lesser-known sports. His voice rose, crested and fell with stories portraying athletes pushing their limits for the “thrill of victory or the agony of defeat”. 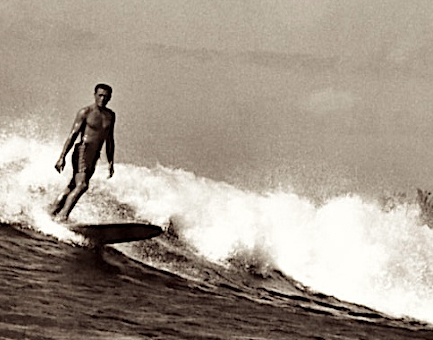 From 1962 to 1965, Wide World of Sports aired the annual Makaha International Surfing Championships. 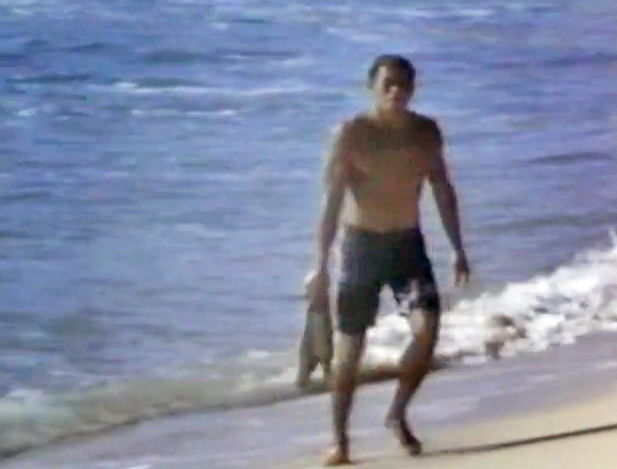 During one show, the long time patriarch of the Makaha Beach environs, Richard “Buffalo” Keaulana was featured bodysurfing along the sandy shore with the incredible grace and the ease of a marine mammal at play with the waves. Perhaps the image of his joy, play and practice of an ancient Polynesian sport crystallized somewhere in my brain. The interview of Buffalo covered his (still) legendary stature as a waterman and I, just a 13-year-old Junior Lifeguard, was hooked. Buffalo stored his swim fins in his refrigerator to prevent their corrosion. Why THAT hooked me? I have no idea, an indelible image seared in my young brain. For many years thereafter, I treasured my fins and fought with my mother’s macaroni and cheese casserole for the prime cold storage location. At that point, a seed of passion grew in my life. A passion born of being knocked down wave after wave, each time jumping up and running back into the shorebreak for one more. A passion maintained by deep pockets of sand in every ear, nose, eye and shorts carried with me nearly everywhere I went. Before I ever entered high school, I had dismissed my father’s passion for baseball and found my own in the water. I wanted to ride like Buffalo across the waves. I was only subliminally aware of his exceptional talent. “California big-wave pioneer Greg Noll once watched Keaulana bodysurf six-foot waves at Yokohama, near Makaha. ‘He looked so natural,’ Noll later recalled, ‘streaking across the waves like a seal. I actually expected him to turn and swim out to sea when he was done” . So by the time I was 16, I was determined to study and bodysurf the most famous bodysurfing wave I knew: The Wedge. By 1969, I was comfortable at Wedge. Two large swells late that summer pushed Wedge passed the 9th pole! After innumerable attempts, poundings and some success in large surf that summer, my high school friend, Bob Gove and I endeavored to visit the legendary islands and waves of Hawaii in December of 1969. We arrived just after one of the largest swells in surf history. Fresh fables circled the island: Greg Noll at 30ft. Makaha and journalist/bodysurfer Bruce Jenkins riding a wave through his wall and across Kam Highway- on his mattress. Five days into our trip, we witnessed Makaha rise from 2-4 feet to 15-18 feet within about 6 hours. Here we camped, concealed in the bushes. One day, a jacket I kept for evening warmth was stolen, but when word reached the local Kahuna, the jacket was returned the following day with a verbal apology. Buffalo had heard of the transgression and corrected it without even having met us. Aloha. Somewhat intimidated and anxious to explore the North Shore, we began “camping” in the yards of unoccupied beachfront homes. After two nights, we were rousted from our sleepy hideouts by radio reports of another impending monster swell. Evacuation orders were again issued for the second time that month. We found shelter in a chance and perfectly timed encounter with one of my Newport bodysurfing friends staying at a ramshackle mountainside bungalow. We awoke from our high perch around 2:00am to the deep rumble of big surf. As the sun rose, we saw mountains of water, waves the size of high-rise buildings, towering and tumbling to the shore. My only estimation of size came by counting a full, one thousand one, one thousand two…five seconds from the pitch of the lip to its impact. No waves since have matched that view. Those last few days on the North Shore molded confidence into a cautious understanding of bigger surf. As we prepared for home on our last evening, we were invited by surfer Mike Purpus and friends for a beach cookout of fresh parrot fish stuffed with corned beef hash. Bob and I had lived on shave ice, almond cookies and the odd can of Spaghetti-O’s, so this was our departure luau. We settled around a small fire when a burly local swam to shore with his days catch. The diver was clearly a local waterman and touted “beachboy” from Waikiki. He welcomed us to share in his catch and we talked story around the fire. When I learned that this man was the Hawaiian surfing legend, Buffalo Keaulana, my adventure was complete. To Buffalo, we were two forgettable grommets among many. Upon us, he bestowed a spirit of aloha which instilled a lifelong memory whose spirit remains the same even while time erases the details. I have not spoken with Buffalo since that day, but I do owe him a debt of gratitude. His aloha launched me into many years of joy and sporting passion. Encyclopedia of Surfing. Richard “Buffalo” Keaulana.